Mark Cooper found success as a manager after leaving Posh. A cursory glance at the list of out-of-work and available managers on the League Manager’s Association website gives a clear indication of the problems now facing Peterborough United chairman Darragh MacAnthony. There are plenty of big names on the list (John Barnes, Tony Adams), but it would be a massive surprise if MacAnthony went down that route as he attempts to find a ‘special’ relationship with a manager other than Darren Ferguson. The Posh chairman was justifiably ruthless yesterday (February 21) in his dismissal of Ferguson and his entire senior coaching team which in itself won’t stop applications from no-hopers or those with potential to meet MacAnthony’s demands. Nor will the fact that MacAnthony needs to make his sixth managerial appointment since his arrival at London Road in October 2006. The prospect of a quick hiring and firing is seen as a fact of life in football management. Ferguson enjoyed two comparatively lengthy stays (at four years and one month he was the fourth longest-serving manager in the country until yesterday), but none of MacAnthony’s other managers lasted longer than the 33 matches Gary Johnson managed. MacAnthony is capable of tough decisions (he sacked Johnson when Posh were seventh in League One), but Posh need the chairman to now make a great decision, initially for stability and the importance of staying out of League Two and then to re-build a squad good enough to emulate the record of the the manager he will replace. After Ferguson left Posh for the first time in November, 2009 Posh employed three more managers before the end of a season which ended in inevitable relegation from the Championship. MacAnthony took a punt on a non-league boss in Mark Cooper which misfired badly at the time, but has subsequently turned out to be a much better decision than it appeared. MacAnthony liked Jim Gannon’s straight-talking, but the manager walked away from Posh for personal reasons rather than accept a longer-term deal and there was an obvious personality clash between chairman and Johnson. MacAnthony’s decision to fire Johnson, even though his team were challenging strongly for promotion, and re-instate Ferguson was a master-stroke. In short MacAnthony has struggled to find a manager he felt able to rely on for success, with one notable exception in Ferguson. The chairman/manager relationship is vital, especially when the ultimate boss has a powerful personality and is prone to social media outbursts which can undermine both players and managers. Ferguson used to laugh that sort of intervention off (he wasn’t on social media himself, thankfully), but other managers might not. But MacAnthony is also generous and loyal to his managers. Even flops like Cooper were backed with cash. MacAnthony spurned the populist decision to sack Ferguson months ago because he wanted to give his friend and his most successful partner as much time as possible to succeed. With MacAnthony at the helm, Posh remains an attractive posting for an ambitious manager with skill and a thick skin. The rewards will be great for anyone who can deliver half the success that Ferguson delivered. Alexander’s compiled the best part of his Posh record before MacAnthony took over, He had the misfortune of losing six League Two matches in a row soon after a ferociously ambitious chairman took control of the club. MacAnthony wanted exciting football as well as winning football and he didn’t think he was going to get either with Alexander. A shock appointment once his surname was ignored, but an inspired decision. Achieved back-to-back promotions in his first two seasons at the club and delivered second tier football for the first time since 1994 with an attractive playing style. Posh under-estimated the strength of the Championship though and Ferguson and MacAnthony fell out after a 3-1 defeat at Newcastle United, a game for which Aaron Mclean was controversially left on the substitutes’ bench and which left Posh bottom of the table. Manager and chairman had a massive row and Ferguson left. Apparently the then Kettering manager was successful at interview after showing a healthy knowledge of Posh form gained by watching dvds of all their matches so far that season. Cooper will admit himself that he was the wrong man at the wrong time, something that MacAnthony realised after just one win in 13 games and the greatest comeback in Posh history (from 0-4 down to 4-4 against Cardiff). There is no doubt that this quirky manager was more highly regarded by MacAnthony than the club’s fans. Gannon managed to fall out with Craig Mackail-Smith which took some doing, but he was a deep-thinking boss who did engineer some improvement in a pretty poor team. MacAnthony wanted him to stay and offered him a new contract, but Gannon had personal issues that demanded a return to the north of the country. Subsequent events suggest Posh might have had a lucky escape. This appointment ‘shook the football world’ according to Posh director of football Barry Fry and, unusually for him, he was only exaggerating slightly. The arrival of a man who had taken Bristol City to within a game of the Premier League did seem a coup, but he never threatened to get to grips with balancing the brilliance of the Posh attackers with some dreadful defending. 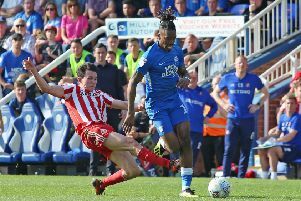 Bringing in Lewin Nyatanga and Marcus Williams on loan at great expense unnerved MacAnthony as soon as she saw them play and a difference of opinion over the club’s direction led to a parting of the ways with Posh seventh in League One. Ferguson’s return to the club after a dismal spell in charge of Preston came as a complete surprise, but again his appointment proved to be inspired. Players who had enjoyed playing for him before were re-energised and Posh enjoyed a romp to the League One play-offs where they downed MK Dons and Huddersfield to seal a quick return to the Championship. Posh performed well for two seasons in the Championship, but a terrible start to the 2012-13 season ultimately cost them a last-gasp relegation from which Ferguson didn’t really recover. He’s pretty much been a ‘dead-man walking’ since October of the current campaign, apparently losing the ability to motivate a struggling group of players.